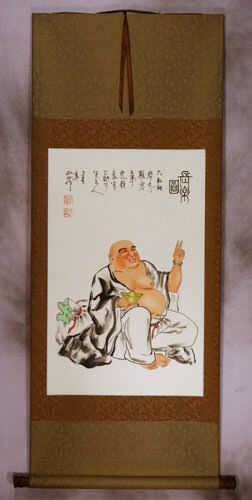 Buy a Tathata Ultimate Nature of All Things calligraphy wall scroll here! 真如 comes from the Sanskrit and Pali word often romanized as "tathata" or "tathatā." Originally written, "तथता." It's a Buddhist term that is often translated as "thusness" or "suchness" but this does not explain it. A better explanation may be, "the ultimate nature of all things." However, this gives it too strong of a feeling. This concept is sometimes described as being in awe of the simple nature of something - like a blade of grass blowing in the wind, or ripples on water. It is what it is supposed to be, these things are following their nature. Amazing in their mundane simplicity. Every sect of Buddhism will have a slightly different flavor, or explanation, so don't get fixated on one definition. Notes: Sometimes Buddhists use the word dharmatā, a synonym to tathatā. In Japan, this can also be the female given name Mayuki, or the surname Majo. Not the results for tathata ultimate nature of all things that you were looking for? tathā 多陀; 但他 (or 怛他), so, thus, in such manner, like, as. It is used in the sense of the absolute, the 空 śūnya, which is 諸佛之實相 the reality of all Buddhas; hence 如 ru is 賃相 the undifferentiated whole of things, the ultimate reality; it is 諸法之性 the nature of all things, hence it connotes 法性 faxing which is 眞實之際極 the ultimate of reality, or the absolute, and therefore connotes 實際 ultimate reality. The ultimate nature of all things being 如 ru, the one undivided same, it also connotes 理 li, the principle or theory behind all things, and this 理 li universal law, being the 眞實 truth or ultimate reality; 如 ru is termed 眞如 bhūtatathatā, the real so, or suchness, or reality, the ultimate or the all, i. e. the 一如 yiru. In regard to 如 ju as 理 li the Prajñā-pāramitā puṇḍarīka makes it the 中 zhong, neither matter nor nothingness. It is also used in the ordinary sense of so, like, as (cf yathā). Some people may refer to this entry as Tathata Ultimate Nature of All Things Kanji, Tathata Ultimate Nature of All Things Characters, Tathata Ultimate Nature of All Things in Mandarin Chinese, Tathata Ultimate Nature of All Things Characters, Tathata Ultimate Nature of All Things in Chinese Writing, Tathata Ultimate Nature of All Things in Japanese Writing, Tathata Ultimate Nature of All Things in Asian Writing, Tathata Ultimate Nature of All Things Ideograms, Chinese Tathata Ultimate Nature of All Things symbols, Tathata Ultimate Nature of All Things Hieroglyphics, Tathata Ultimate Nature of All Things Glyphs, Tathata Ultimate Nature of All Things in Chinese Letters, Tathata Ultimate Nature of All Things Hanzi, Tathata Ultimate Nature of All Things in Japanese Kanji, Tathata Ultimate Nature of All Things Pictograms, Tathata Ultimate Nature of All Things in the Chinese Written-Language, or Tathata Ultimate Nature of All Things in the Japanese Written-Language. 0 people have searched for Tathata Ultimate Nature of All Things in Chinese or Japanese in the past year.